Review: The ever-interesting Eddie Ruscha returns with a new Secret Circuit full-length, the first on Tim Sweeney's excellent Beats In Space imprint. Given the usually vivid style of his psychedelic electronica, it's no surprise to find that Tactile Galactics is a mesmerizing trip from start to finish. Ruscha darts between kaleidoscopic space disco, wide-eyed shoegaze house, analogue psychedelia, touchy-feely ambience and intense, druggy Italo, somehow shoehorning 25 years of musical misadventure into 70 spellbinding minutes. It's bold, melodic, hypnotic, beautiful, blissful, intense, inspiring and exciting. 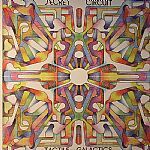 Put simply, Tactile Galactics is a great album. Played by: Alexis Le-Tan, Jimpster, Lexx, Napsugar, GK Machine [Invisible, Inc.], Marius Circus, Richard Gateaux, Justin Van Der Volgen, Soft Rocks, Bradley Zero, Eric Duncan, Juno Recommends Disco, Nick The Record, Ben Monk, Woody Wood Jr., Señorlobo (Lovemonk), Glenview Records Inc, COYOTE is it balearic?